Long Beach, Calif. November 25, 2013. Formula DRIFT is celebrating a milestone after its Facebook page achieved over 1 million likes from its fans around the world. 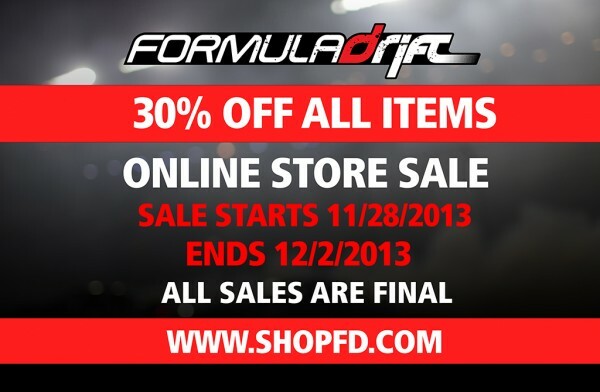 The Formula DRIFT Facebook page (www.facebook.com/formuladrift) provides information on the Series, drivers and more. We would like to thank our fans for supporting the Series and helping our Facebook page organically grow to reach over 1 million fans, said Jim Liaw, president and co-founder of Formula DRIFT. Our young tech savvy fans challenge those of other motorsports for being the most active and engaging fans on social media. Growth to 1 million Facebook fans has been done organically without the help of social media agencies, purchases of likes or special Facebook promotions. Additionally, the fan count from Formula DRIFT Asia Facebook page was not taken into account, which currently has over 100,000 Facebook fans. Comparatively, to other motorsport Facebook pages, Formula DRIFT ranks amongst the top for quantity of fans. NASCAR currently has 3,711,205 fans, Formula 1 has 1,448,735, World Rally Championship (WRC) has 1,074,102 and IndyCar with 173,531 fans on Facebook. During Formula DRIFT event weekends the Formula DRIFT Facebook page receives over 2 million impressions. The Facebook platform is a key component in Formula DRIFT cross-media portfolio, which also includes Twitter and Instagram. 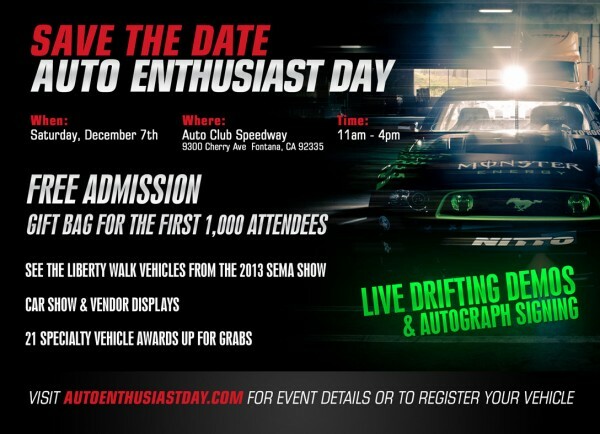 Visit Auto Club Speedway on Saturday, December 7th to help celebrate the inaugural Auto Enthusiast Day presented by Nitto Tire. In addition to the 400+ show cars & trucks on display, there will be vendors, raffles, live drifting demonstrations, autograph signings by Formula Drift superstar and driver of the Monster Energy Mustang RTR Vaughn Gittin Jr., plus much more! Best part about it, the event is completely FREE of charge! 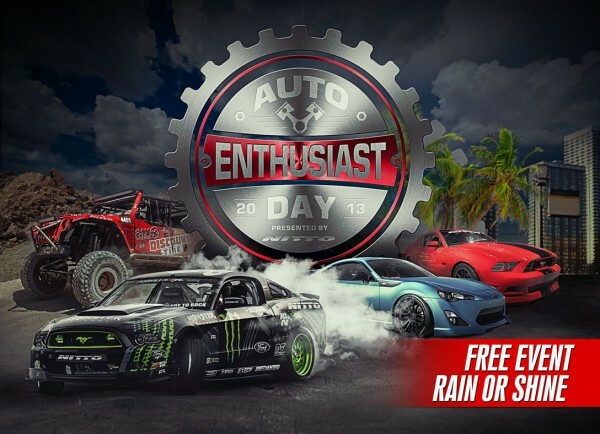 Visit www.autoenthusiastday.com for more details. Posted in Events | Tagged Nitto Tire, Vaughn Gittin Jr.
Singapore, 22 November 2013 – Formula Drift Asia will be returning to Thailand in 2014, in replacement of Formula Drift Indonesia initially scheduled for December 2013. This will serve as the final leg of the 2013 season, as well as the opening round of the 2014 season. The last time the Series was held in Thailand was back in 2010. To be held at Pathum Thani Speedway on 18 and 19 January, Formula Drift Thailand 2014 is co-organised with Grand Prix International Co., Ltd (GPI), which owns the Bangkok International Motor Show, several motorsport events, a host of magazines such as Grand Prix and XO Autosport, as well as television channel Grand Prix Channel. For the first time ever, there will be ‘live’ streaming for Formula Drift Asia events so fans from all over the world can keep up with the sideways smoking action. “We brought the first international drifting competition to Thailand four years ago and we are excited to be able to bring Formula Drift back. The timing is right as we have integrated and merged the Formula Drift Asia and USA offices to lay a foundation to create a world championship series,” said Jim Liaw, President and Co-Founder of Formula Drift. In other exciting news, Formula Drift will merge their USA and Asia operations from 2014 with a global headquarters in Long Beach and a regional office in Singapore, in anticipation for a World Championship in 2015. The merger comes after six years of successful event operations in Asia taking Formula Drift to Singapore, Thailand, Indonesia, Malaysia and Australia. Formula Drift Asia licensor Driftpac will remain an integral part of the Formula Drift events in Asia and will continue to assist in expansion of the brand. The plan for 2015 is to operate a world championship where some or all of the events on the Formula Drift USA and Formula Drift Asia calendars, as well as possible new host venues, will count towards the world championship. Formula Drift Asia has been a key drifting event within the region since its inaugural season in 2007, bringing the excitement and heart-stopping track action to fans in iconic locations such as the Formula One Singapore Grand Prix’s Marina Bay circuit and the historic Merdeka Square in Kuala Lumpur. The most diverse and talented pool of drivers from Hong Kong, Indonesia, Singapore, Thailand, Malaysia, New Zealand, Australia, Norway, USA and Japan have competed in the series. Expect the usual array of international drifting stars like Daigo Saito, Fredric Aasbo, Robbie Nishida, Kenshiro Gushi, Josh Boettcher and Tengku Djan. Do look out for more details on Formula Drift Thailand 2014 and also the rest of the 2014 calendar. For more information, kindly log on to www.formuladriftasia.com or www.facebook.com/formuladriftasia. For enquiries or requests, contact Cheryl at cheryl@formulad.com or +65 9733 5122.